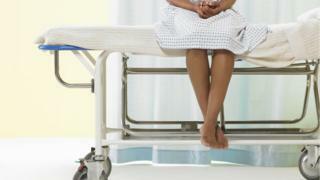 More than one in 10 seriously-ill patients in England face long delays for a hospital bed after emergency admission. BBC analysis of NHS figures showed nearly 475,000 patients waited for more than four hours for a bed on a ward in 2015-16 - almost a five-fold increase since 2010-11. Hospitals reported using side rooms and corridors to cope with the growing number of "trolley waits". Doctors said it showed hospitals were now dangerously overcrowded and demanded action be taken. It comes as three-quarters of hospitals are now reporting bed shortages as winter hits. Bed occupancy is not meant to exceed 85% - to give staff time to clean beds, keep infections low and ensure patients who need beds can be found them quickly. But 130 out of 179 hospital trusts are reporting rates exceeding this for general hospital beds. Hospital managers said the problem was causing these "deeply worrying" delays for the sickest patients. They are people who have already faced a wait to be seen in A&E, but whose condition is deemed to be so serious they need to be admitted on to a ward. About one in five people who come to A&E fall into this category and it includes the frail elderly and patients with chest pains, breathing problems and fractures. of emergency patients face a 4 hour "trolley wait"
The BBC analysed figures collected by NHS England on trolley waits, but not publicised in their monthly releases. The BBC found 473,453 patients waited more than four hours for a bed between October 2015 and September 2016 - 11% of the 4.2 million patients admitted in total during the period. More than 1,400 of them faced delays of more than 12 hours. It compares with 97,559 "trolley waits" in 2010-11 - although NHS England pointed out a small fraction of the rise could be attributed to a change in the way the waits were measured in December 2015. Directly comparable figures are not available for other parts of the UK, although data suggests there is an increasing strain on beds. While the delays are known as "trolley waits" not all patients find themselves on one. Hospitals use all sorts of areas, including side rooms, seats in the A&E department and spare cubicles depending on what is available. Rupert Nathan, 55, was rushed to hospital in an ambulance when he started suffering chest pains at home in June. He had previously had two angioplasties - one in 2000 and one in 2001 - because of angina and feared he was having a heart attack. He was taken by ambulance to Barnet Hospital in north London and was given blood and heart tests. At that point, staff decided to admit him for further checks. But he spent more than five hours waiting for a bed. "I was left in a waiting area with my girlfriend. I was in pain and really concerned. There was little contact with staff and it was after midnight when I was finally found a bed." He asked for morphine and was told he would undergo scans in the morning. But when morning came, he was in a much better state and was discharged. "I was told the delays were because it was very busy. I could see that, but it's still not acceptable." Mr Nathan has made a complaint about his care. The hospital said it was sorry about the long wait, but said this can happen at busy times. It said it had to prioritise patients and maintained the way he was cared for was "appropriate". Siva Anandaciva, of NHS Providers which represents hospitals, said: "These figures are deeply worrying. We are heading into winter in a more fragile state than I have seen in the past 10 years or so. "Even the historically top-performing trusts are being challenged, which shows that this is an issue affecting all parts of health. "No-one wants to see people waiting in corridors, side rooms and emergency bays when they should be admitted to a hospital bed. These patients are still under the care of doctors and nurses of course, but it is not ideal for them and we know overcrowding leads to worse outcomes." Dr Chris Moulton, of the Royal College of Emergency Medicine, echoed the concerns. "Patients who are delayed like this are still being monitored by staff. But we know that the overcrowding we are seeing is dangerous. It leads to worse outcomes for patients - higher infection rates, patients ending up on the wrong wards and generally a negative experience." Dr Moulton believes there are too few beds. There are just over 100,000 general beds in England - a fall of 40,000 in the past 20 years. "We simply don't have enough. If you compare us to other European countries we are really short and the demands being placed on the health service means we are now struggling to cope," he added. A spokesman for NHS England said "growing demand" was putting pressure on the system - the number of emergency admissions having risen by more than 500,000 in five years to 4.2 million. But he added it was "a tribute to front-line staff" that the NHS was able to handle so many patients.